I have been so busy, so busy I feel like my head is spinning. I’m the kind of person, that usually says ok to things and I tend to overwhelm myself with projects. It’s good because I’m always busy, but sometimes it’s just too much. Wednesday was a big day for me. I got an e-mail from Trader Joe’s showing 5 semi-finalists for a quinoa recipes. I submitted my recipe back in January and when I got the e-mail it said here are the top 5 finalists, please vote for your favorite. I was reading the name of the recipes and one looked like the one I submitted. I opened up the attachment, and guess what it is my recipe. They didn’t have any names on the recipe, nor did they inform me, but I am assuming it’s my recipe, since it’s word for word mine! Woohoo!! I don’t remember what the prize is, except that you get your recipe in the next flyer. I made a Chocolate Coconut Quinoa Bake. I am so excited!!! This really made my day!!! Here’s the link to the recipes if you want to check it out, my entry is #2. 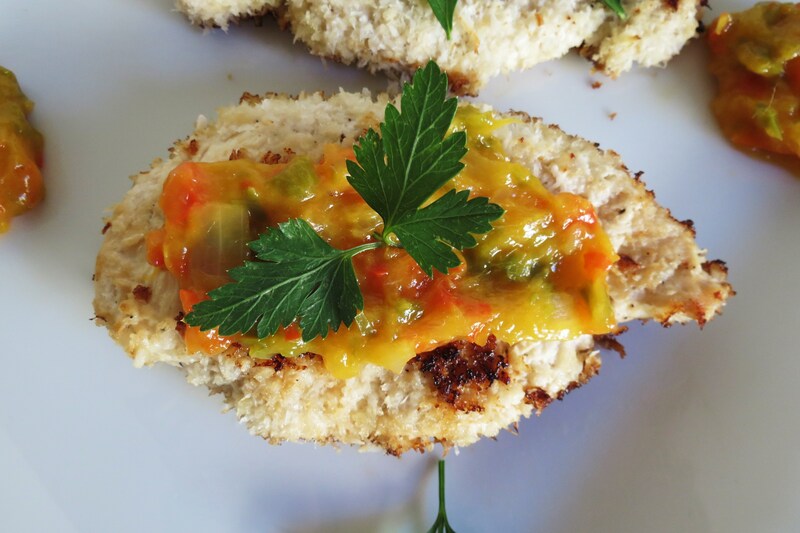 I’m not allowed to post my recipe on my blog, since Trader Joe’s now owns it. But you know I wanted to show you anyways. I’m so excited, this kind of thing has never happened to me before. I’m also working on another project, which I can’t share with you right now, but hopefully I will in the next few weeks. This is a time-consuming project. So enough about my crazy day, I wanted to share with you a wonderful recipe that I made Tuesday night. When I was in Tahoe last week, I had the most wonderful dish! It was coconut and panko halibut. I loved it! I never get to have any kind of fish at home since my family doesn’t like to eat fish, so I always order it when I’m out. 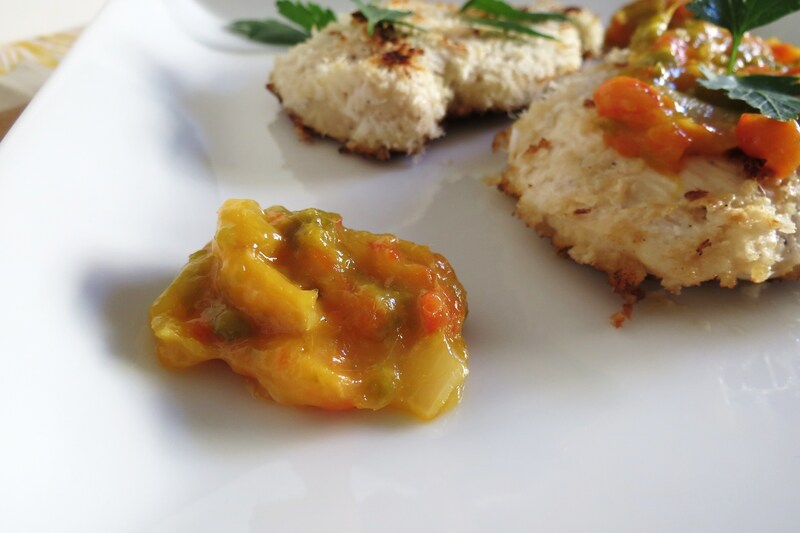 So instead of fish, I decided to make Coconut Chicken with a Mango Chutney. Oh my gosh! If you love crispy and coconut, you’ll love this dish! My Husband who doesn’t believe in having fruit with dinner loved it! He ate his whole dinner, except he didn’t have the Mango Chutney. Thats why there is only one piece with Mango Chutney on it. The Mango Chutney was not planned. I wanted to make my Mango Salsa, but the mango I had, was over ripe. So instead I decided to cook it up with onions, sweet pepper and a jalapeno. So glad I did this. It was thick, sweet and spicy. It was a perfect match with the Coconut Chicken. I really love mangos, but it’s one of those fruit that I buy, but never eat. Sometimes I get to lazy to peel and cut it. Stupid, huh? Than I have to toss it because it goes bad. This meal was actually really simple to put together. I marinated my chicken, while at work in unsweetened coconut milk. Than in a shallow bowl I added my panko bread crumbs and coconut. Placed it in a skillet and fried it for 10 minutes. Dinner with the Mango Chutney took about 20 – 25 minutes to make. Not to shabby!!! Little Jenny was disappointed that she missed out on Coconut Chicken, it’s one of her favorites. I like that I fried it in a little bit of canola oil. It gave it the perfect crunch! In the picture I added cilantro to the chicken, but honestly I’m not a big fan of it. So I placed it on top to make it look pretty, however, if you’re a cilantro fan, add it to the chutney, you’ll love it!! 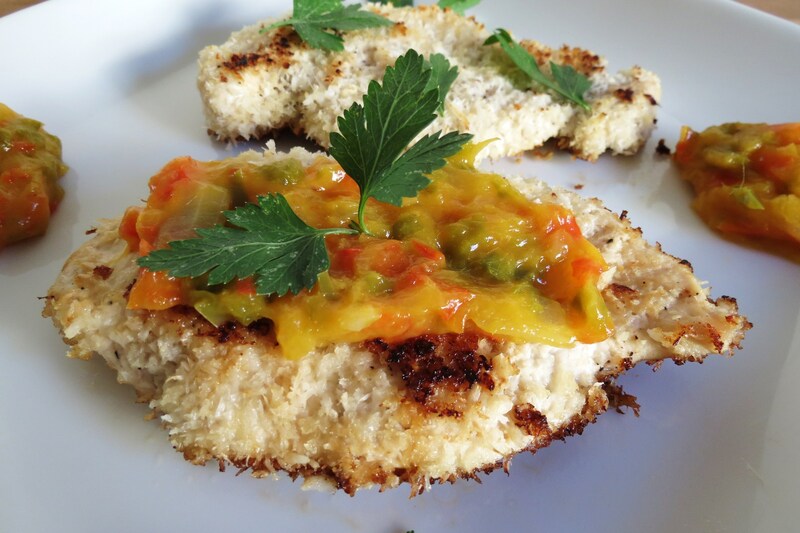 Moist and crispy fried coconut chicken, topped with a sweet and savory mango dressing. Add salt & pepper to chicken and place in a ziplock bag or shallow bowl, add the coconut milk and marinate for 4 to 8 hours. Place all the mango chutney ingredients in a skillet and cook until thick, about 10 minutes. Keep mixing together so it doesn't burn. Once it's cooled enough to handle, place in a mini food processor and blend until pureed. Set a side. In a shallow bowl add panko bread crumbs and coconut. In a skillet add cooking spray and canola oil, and set burner to medium heat. Drain the coconut milk from the chicken and place chicken in bread crumb mixture, be sure to cover the whole piece of chicken, and place in skillet. Cook chicken for about 5 minutes per side until no longer pink. Note the calories maybe less, I had some chutney and bread crumbs left over. 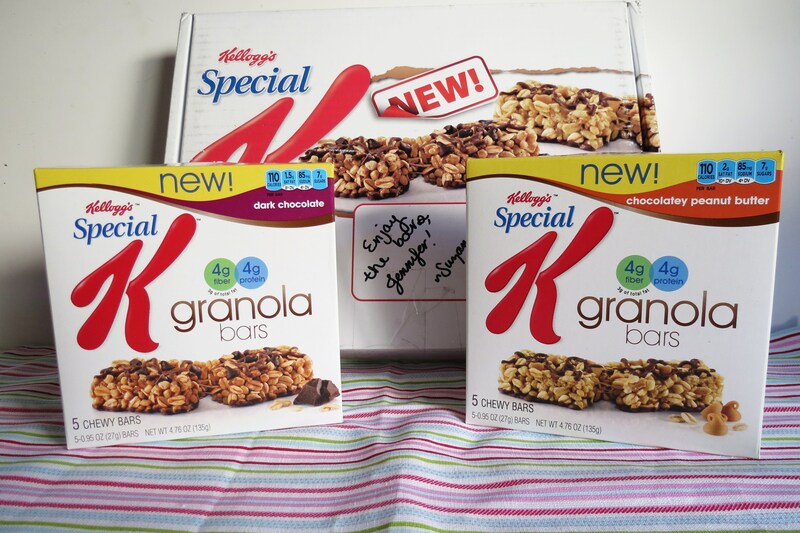 I was asked by Special K to try out there new Dark Chocolate and New Peanut Butter Granola Bars. 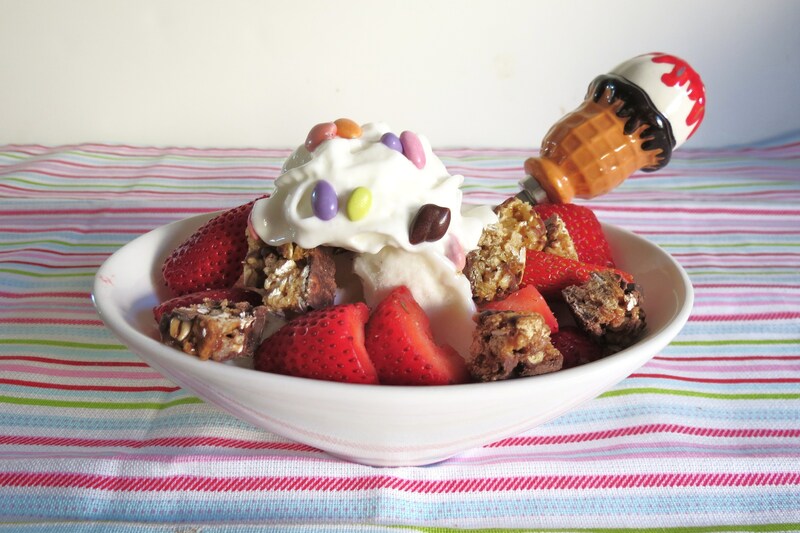 Ummm, Chocolate, Peanut Butter and Granola, hell yah! You know I wasn’t going to turn that down. So what did I think of their new bars? There good! I’m actually impressed with the stats o them. Each bar has 110 calories, 3 grams of fat, 85 grams of sodium, 17 carbs, 4 grams of fiber, 7 grams of sugar, and 4 grams of protein. I would definitely buy these. I’m popping them in my purse, so when my energy is down or I have a candy bar craving, I’ll pull out one of these granola bars! Special K must have known my love for anything granola and peanut butter! So how did I eat these tonight? Well, I chopped them up and placed them in my Frozen Yogurt! They were perfect in it! Thank you Suzanne for sending them to me!! Well everyone, tomorrow I have a baby shower at work, so I need to bake a cake! If it turns out well, I’ll be sharing the recipe with you later this week or next! Congrats on being a finalist!! That’s SO awesome! I’ll have to scour my local flyer when the recipe comes out! I’ve been eating a mango a day the past few weeks…they are definitely my favorite fruit! Love the chutney that you made with them! Thanks Joanne! You know what weird? I love mango too, but everybody I know doesn’t like it. I find that so odd. I haven’t met one person who likes mango, except for you. Thank you for the invite! I linked up my recipe! Thank you for hosting and having me!! I love the coconut and mango in this recipe, it is perfect for summer and with a nice tropical twist! I think you will win the contest hands down b/c that recipe sounds yummy! I tried a mango last week for the first time and it was pretty good. Lol. It better be for one dollar for 1 piece of fruit! That chicken looks delish and it would go perfect w/ the cherry smoothie. Can’t believe I missed that post! Congratulations, Jen! 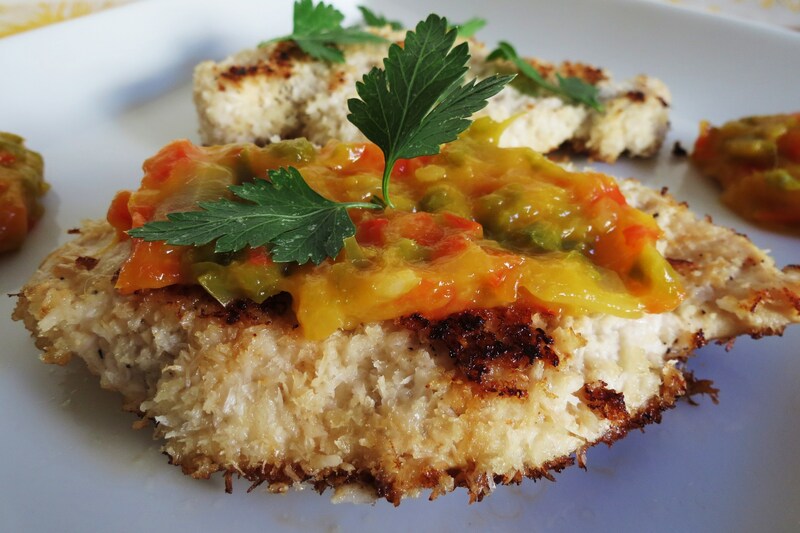 This chicken dish looks absolutely mouthwatering. Hope you have a great weekend! Yah! Sometimes I make something or have an idea for something, than someone posts it and I don’t end up posting mine because I don’t want them to think I’m stealing there’s. Funny how that works! OMG HOW EXCITING FOR YOU!!! This looks delicious too! I adore mango chutney and coconut! YUM! I made a mango chutney tofu (rather than chicken) and this looks delish! 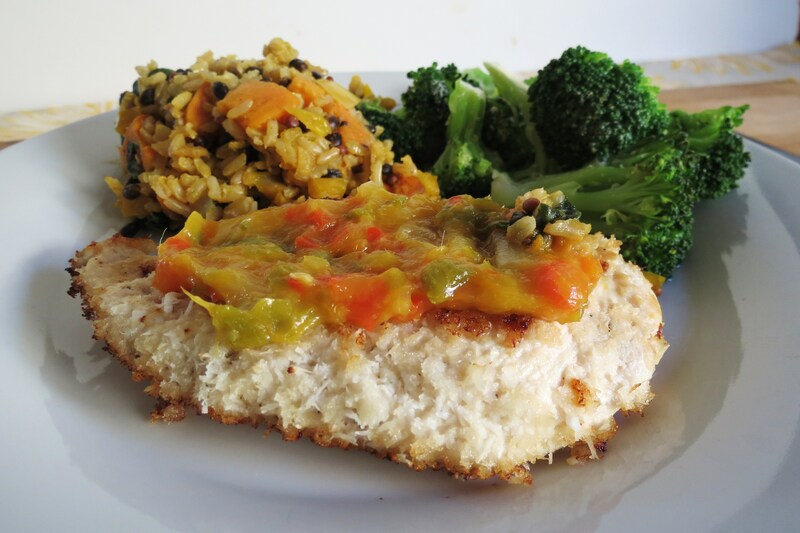 The mango chutney has been so well paired coconut flavored chicken! One of my favorite combos is coconut and mango. there a perfect match! Looks delicious. I was just thinking about the coconut oil that I have in my fridge and wondering if it would be overkill on this chicken. Hi Jill, You could use coconut oil to replace the olive oil inthe dish. I don’t think that would be an overkill, since there isn’t to much oil in this recipe. I’d try it! I made a variation of your chicken for dinner tonight. It was delish. My slight change, I had some left over nut crumbs from pumpkin seed/cashew clusters. I added them to the food processor with the coconut then mixed it together with the panko so it was in disguise and my hubby would not pick out the coconut. 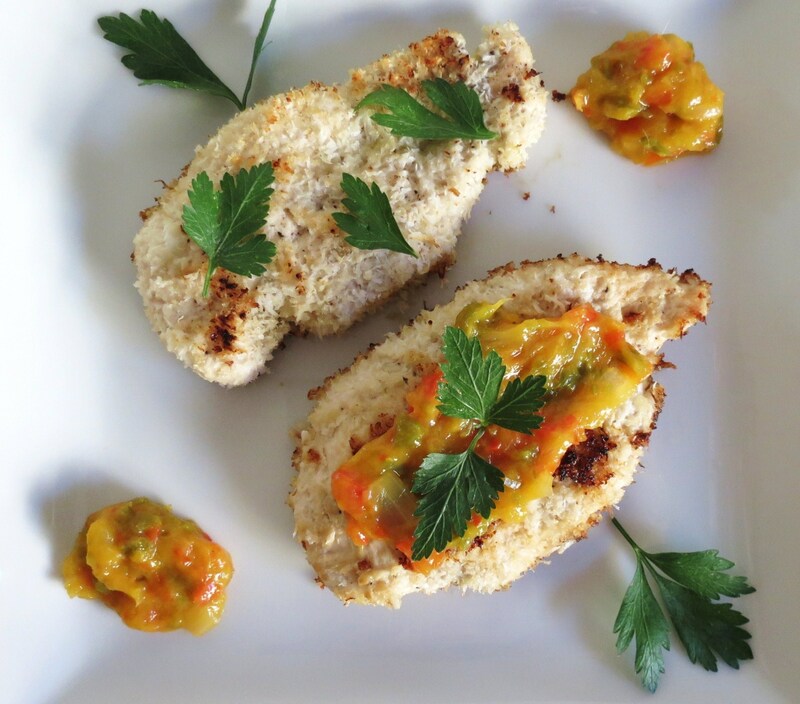 I did not have mango but had some wonderful apricot/chili preserves which I opened and topped the chicken with. (Oh yeah, I cooked in coconut oil as well.) Thank you so much for the inspiration. Thanks for linking up to the Piece of Cake Party. 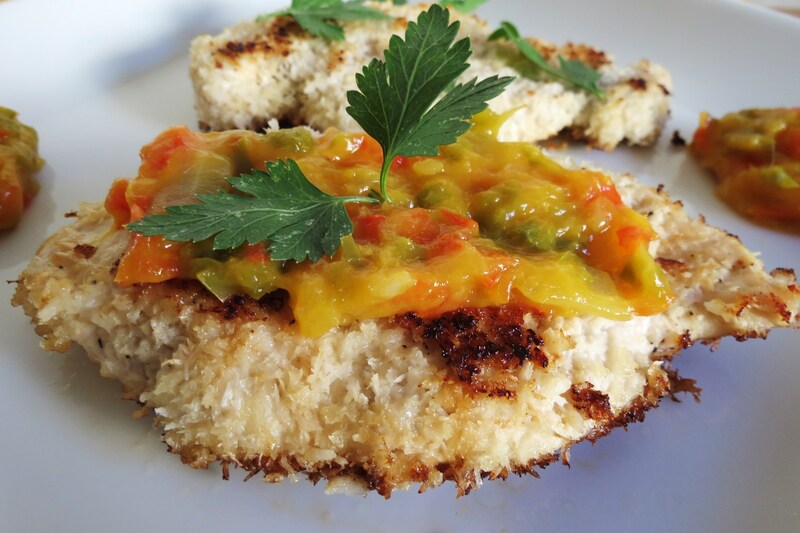 Looks delicious–then again it has mango, coconut, cilantro–how could it not be! See you next week! Can’t wait to try this. Looks divine! I love coconut and have always wanted to try a homemade chutney. Thanks so much for linking up to Creative Thursday last week.